The Chicago Bears avoided the dreaded 0-2 start with a 24-17 win over the Seattle Seahawks in the NFL on Monday. Behind Khalil Mack and under the direction of first-year coach Matt Nagy, Chicago came out on top. Seattle will now fight through the season to try to become only the 11th team since 2007 to make the playoffs after opening with two losses. But, if what the Seahawks showed at Soldier Field was any indication of how they will match up against top-tier defenses, those chances are not good. Mack delivered another impressive performance. Wilson was not able to do what he does best, drop back and make plays. Instead, he was trying desperately to escape Mack, who was one of Chicago's top defensive players. He finished with five total tackles and one sack. Roquan Smith added seven total tackles while Danny Trevathan tallied eight tackles and two sacks. Seattle's offense struggled at the line of scrimmage, exposing Wilson to pass rushers all game long. He was sacked six times throughout the game, pushing Seattle's allowed sacks total to 12 – the most in the NFL through two games. On the other end, Chicago's defense now leads the NFL with 10 sacks this season. The Seahawks entered Monday with a 19-4-1 record in primetime games since Wilson's rookie season in 2012. But there were a few things missing this time around. Key playmakers in Seattle's defense, known as the Legion of Boom, were not able to suit up for their first of five primetime matchups this year. 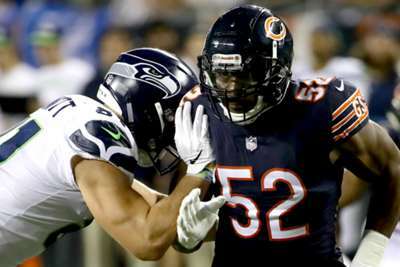 Starters Tre Flowers, Bobby Wagner and KJ Wright were all nursing injuries and missed the game against the Bears, leaving many to question what type of defense would show up. It ended up being a defense reminiscent of Seattle in their prime, with the help of Shaquill Griffin and newly signed linebacker Mychal Kendricks making big-time plays. The defense held Trubisky to 200 yards after letting Broncos quarterback Case Keenum rack up 329 in week one. Trubisky finished 25-of-34 passing with two scores and the two interceptions. Wilson has been known throughout his career as a player who is clutch in the fourth quarter. He has strung together 19 fourth-quarter comebacks and 23 game-winning drives in his career and last season led the league with 19 final-frame touchdowns. So, when he entered the fourth quarter down just one score all hope was not lost – until it was.